A partnership between the local tech hub, XLRator, and the Fraser Valley Tech industry is seeking collaborators for the proposed geospatial artificial intelligence cluster. Whether you are an innovator, early-stage company or an established organization within the Geospatial or AI space, XLRator is accepting applications for participants and interested partners. Deadline for applications is April 30, 2019. 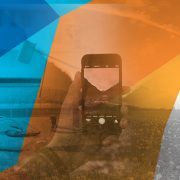 FRASER VALLEY, BC, March 19, 2019 – The Fraser Valley’s most established tech hub, XLRator, is bridging high education institutions, local school districts, industry, and other technology stakeholders to collaborate with the intent to form a local, Valley-based, Spatially Enabled AI (SEA) technology cluster initiative. The cluster aims to collaborate with entities both within and beyond the Fraser Valley; particularly with a keen interest from Alberta-based companies and programs. Alberta, driven by the energy and resource sector, is the largest producer of Map-based and Geomatics companies in Canada. The planned SEA cluster aims to leverage Machine Learning and enhanced data analytics methodologies to expand upon an already strong local geospatial technology presence and its ties to the Alberta market. Whether you are a player in the local Agriculture and Manufacturing industries or any other sector, you must consider the applications of AI and Machine Learning and take them very seriously, or your competitors will. The SEA initiative plans to partner with some of the country’s most prominent technology and data providers and is pursuing partnerships with local higher learning institutions to leverage their respective GIS/Geomatics and Machine Learning programs to draw upon researchers and students in order to ensure the success of the planned cluster. Additionally, SEA plans to work with local School Districts to plant seeds among students as early as grade 7 and 8 and prepare them for a career in technology. Companies are encouraged to contact [email protected] to inquire about collaborations with XLRator as an early partner by April 30, 2019. Municipal school districts, post-secondary institutions, private industry, and government agencies are all encouraged to participate and will be given priority status during the application process. Those that are accepted into the cluster initiative will benefit from a collaborative ecosystem that will allow for open mentorship, discussion, and insights into the geospatial technology field and the many facets of Machine Learning and Artificial Intelligence applicable within many industries and sectors. XLRator is a coalition of local government, industry partners, and higher education institutions interested in attracting tech-based investment into the Eastern Fraser Valley (including the District of Mission, Cities of Abbotsford, Chilliwack, and Maple Ridge, and the Township of Langley). At XLRator, we understand the necessary infrastructure and programs required within the Region to create jobs, foster innovation and drive skilled training. Technology Focused Chilliwack Hackathon Returns for a Third Time Exposing Fraser Valley Entrepreneurs to Valuable Resources and Experience in the Tech Start-up Industry. 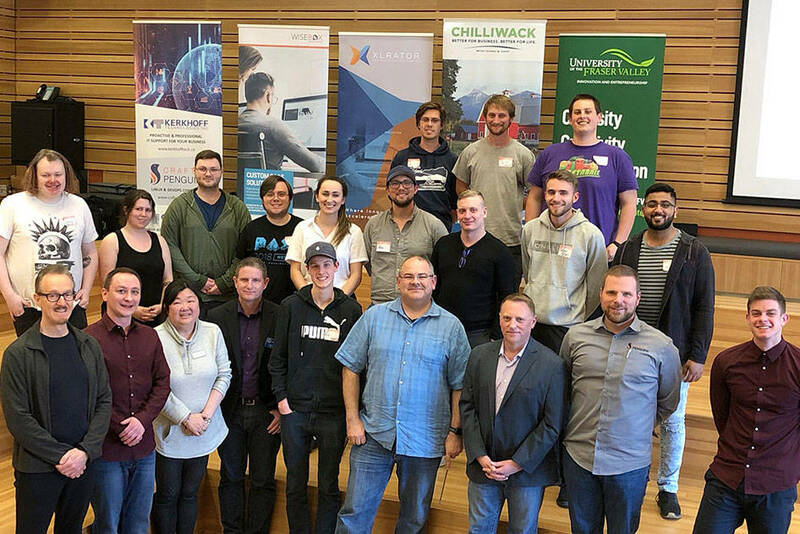 CHILLIWACK BC, March 4, 2019 – Chilliwack is once again playing host to its innovative technology Hackathon event. The Hackathon, hosted by the Chilliwack.Tech chapter of XLRator, running for the third year in a row. The event will assemble local technology, business and design students and innovators to compete in a 24-hour tech start-up sprint. The Startup Hackathon will begin on Friday March 22 at 5pm and will conclude on Saturday March 23 at 5pm in building A at UFV’s Chilliwack Campus. Chilliwack has established a strong presence in the BC technology sector, most recently announcing a strategic partnership with XLRator and will look to create strong relationships among post-secondary students. The event will challenge teams to ideate, create, and innovate under a 24-hour time crunch and present their tech start-up to judges. There are no limits on the projects as long as high-tech is at the core of the business. Anyone over the age of 18 can register individually or as a team. The event will be mentored by local tech professionals such as David Leger (Founder of Loop Energy), Colin Schmidt (CEO of Wisebox.Solutions) and more. To conclude the event, the teams will present in front of judges and the winning team will be awarded $1250 towards starting their business, six months of office space worth $2100 in the Downtown Business Centre, and one year of 1-on-1 mentorship from the Chilliwack.Tech Meetup community. The final presentations and awards ceremonies are open to the public to attend at no cost. Registration for the event is now open at Chilliwack.tech/hackathon for a fee of $10 plus applicable tax. Chilliwack.Tech is part of the Chilliwack Innovation Network, which is in partnership with I&[email protected], XLRator, ACETECH, Community Futures South Fraser, and Chilliwack Economic Partners, and is hosted by Wisebox. 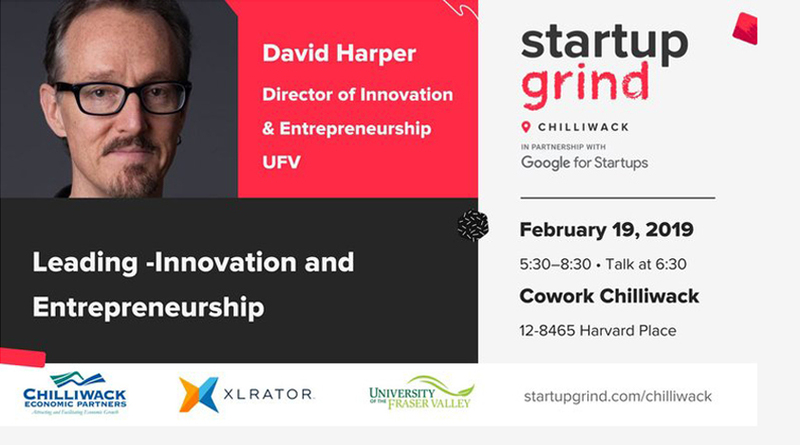 CHILLIWACK BC, February 14, 2019 – Local technology CEO and Health Science educator Dr. David Harper is joining the Startup Grind presented by Google lineup to speak about Leadership in Innovation and Entrepreneurship. This presentation is an excellent supplement to the Fraser Valley’s rapidly growing tech startup ecosystem. Dr. Harper currently balances multiple roles including local technology CEO, Professor of Health Science at the University of the Fraser Valley (UFV), as well as Director of Innovation & Entrepreneurship at UFV (I&[email protected]). Adding to his plethora of accomplishments and responsibilities, Dr. Harper recently wrote BioDiet, the Scientifically Proven Ketogenic Method for Losing Weight and Improving Health, which is set to be published on May 7, 2019. On February 19, we invite you to join Dr. Harper’s fireside chat at Cowork Chilliwack from 5:30 pm – 8:30 pm. The event will kick off with an hour of food and networking with Dr. Harper taking the stage at 6:30 pm. The night will conclude with an additional networking period following Dr. Harper’s presentation. Tickets are on sale now and available at www.startupgrind.com/chilliwack. StartupGrind is one of many entrepreneur & technology focused events that have gained traction in the Fraser Valley. Technology is growing and so is the demand for it, especially in emerging economies like the Fraser Valley. If you are interested in keeping up to date with local technology news and events, please email [email protected] with the subject line “Newsletter Subscription” and you will join 500 Fraser Valley residents in receiving monthly e-newsletters. Startup Grind Chilliwack is sponsored by XLRator and connects the online and offline network of vibrant startup communities to help fuel innovation, economic growth, and prosperity at the local level. 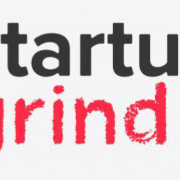 While Startup Grind was founded in Palo Alto, California, the extended network of Startup Grind chapters are located around the world, including Startup Grind Chilliwack. Chilliwack Tech Has Become an Official Chapter of Regional Technology Consortium, XLRator. MISSION, BC, JANUARY 28, 2019 – XLRator today announced it will be incorporating the vibrant high technology sector in Chilliwack as an official chapter. This incorporation by XLRator will provide Chilliwack.Tech additional program management and marketing resources, further strengthening the thriving entrepreneurial infrastructure within the Fraser Valley. The partnership is a significant step towards increasing the economic impact of the Fraser Valley technology sector within the region. 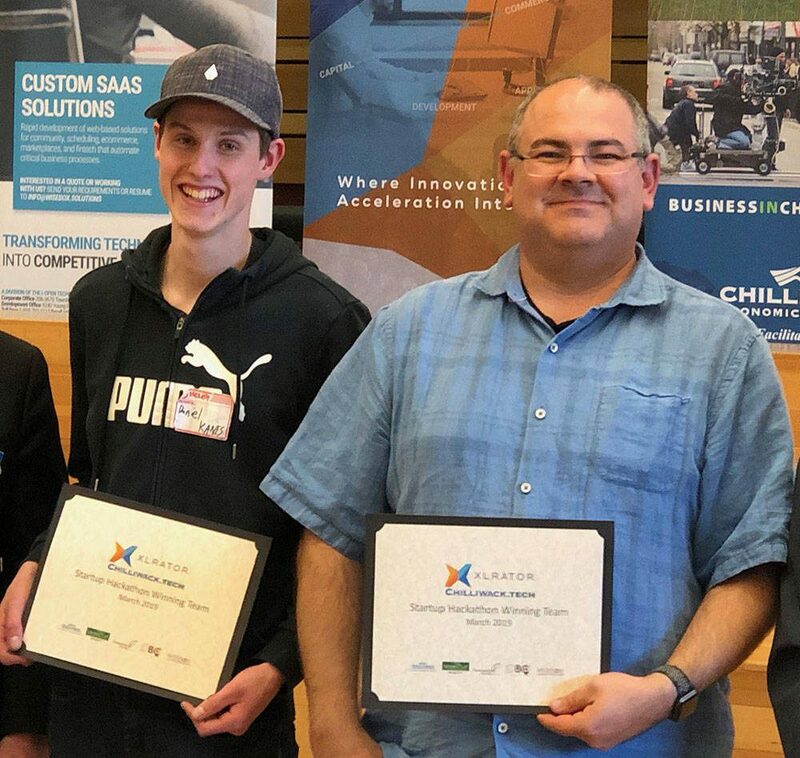 Chilliwack.Tech brings a trove of successful programs to XLRator including the annual Startup Hackathon, the yearly /Next event, and the monthly Chilliwack Meetup which was recently revamped to Startup Grind presented by Google. 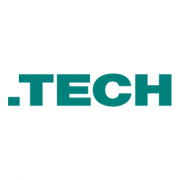 Chilliwack.Tech adds an active directory of 25+ CEOs and high technology entrepreneurs engaged in the community to the XLRator brand. “We hope to grow the high technology industry in Chilliwack by 10x in the coming years with the resources XLRator provides. We’re excited about this partnership and are eager to proceed as a chapter under the established XLRator brand,” says Colin Schmidt, founder of Chilliwack.Tech. “The regional value propositions and infrastructure such as an International Airport, our close proximity to Vancouver as the global tech hub accessible by both highways and the west coast express, two major border crossings connecting the entire US northwest corridor, lower cost of doing business/cost of living, and higher quality of life for workers to start and grow families, will contribute to the the Fraser Valley as an untapped market for knowledge-based and digital economy,” mentions Raymond Szabada, CEO and Chairman of the Board of XLRator. XLRator is a coalition of local government, industry partners, and high education institutions interested in attracting tech-based investment into the “Region” (including the District of Mission, Cities of Abbotsford, Chilliwack, and Maple Ridge, and the Township of Langley). At XLRator, we understand the necessary infrastructure and programs required within the Region, to create jobs, foster innovation and drive skilled training. XLRator was nominated, among many other great organizations, for the 2018 Educational Leader Award as part of the Mission Chamber of Commerce’ Business Excellence Awards. It is an honor to be recognized by the community that we have invested great amounts of time and effort in to. Our aim was to position Mission as a technology hub and we feel that we have done a great job connecting industry, academia, and government for the greater good of our region. We are pleased with how far we have come in the past few years but look forward to an even better 2019. CHILLIWACK. 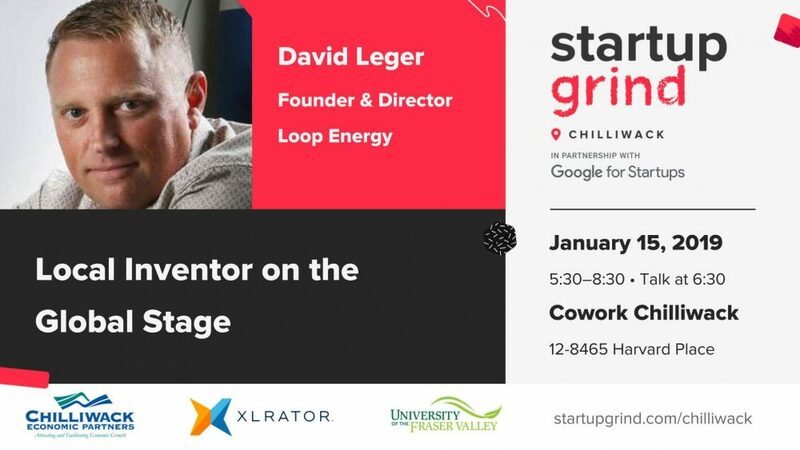 BC, JANUARY 8, 2019 – High technology entrepreneur, David Leger, will be speaking at Startup Grind Chilliwack on Tuesday, January 15th, 2019 on the unique experiences that led him to become a self-taught businessman, problem-solver, and inventor that has raised millions towards the successful development of world-changing technology. The company he founded nearly 20 years ago, Loop Energy, has grown into a Canadian leader and disruptor in fuel cell technology and offers affordable zero-emission solutions to urban environments and industries where it is demanded most such as transportation and shipping. The unique value of Loop’s fuel cell range extenders is the company’s patented technology eFlow, a design that maximizes the power, efficiency, and durability through optimized air flow. Consequently, Loop fuel cells produce considerably more power output in the same physical footprint and at a lower total cost of ownership versus diesel engines. David Leger will be addressing Chilliwack’s entrepreneurial community on his journey at the Cowork Chilliwack offices located at 12-8465 Harvard Place, Chilliwack, BC on Tuesday, January 15th, 2019. The event begins at 5:30 pm, leaving interested parties enough time to commute to the event after work. Tickets are on sale now and available at www.startupgrind.com/chilliwack. Startup Grind Chilliwack is sponsored by XLRator and connects the online and offline network of vibrant startup communities to help fuel innovation, economic growth and prosperity at the local level. While Startup Grind was founded in Palo Alto, California, the extended network of Startup Grind chapters are located around the world, including Startup Grind Chilliwack. Aligning local government, provincial government, and industry to support innovation, industrial research, and tech transfer to increase skilled tech training and local jobs. The Fraser Valley is an incredibly diverse region with an abundance of agriculture, manufacturing, and aerospace-focused enterprises. With a sprawling geographic land area of 13,362 square kilometres, unifying the region as a connected and collaborative district required a concentrated effort on the part of local governments, multiple industries, and academic institutions. Along with a segmented population base, entrepreneurs spread throughout the region were not able to connect with any one institution or organization to further their business goals within the region. Though the Fraser Valley is home to some of the brightest and most innovative companies in British Columbia, their ability to network with one another was limited to events within their local municipalities and Greater Vancouver. Raymond Szabada, the visionary and founder of XLRator (formerly known as SRCTec), and the volunteer board comprised of seasoned tech entrepreneurs helped bridge this gap of collaboration through an innovative approach to community alignment. British Columbia is home to a vibrant and dynamic tech sector that is a major driver of job growth and clean industrialization. As this sector rapidly grows and emerging technologies and tech companies locally and globally set their eyes on B.C. and its thriving regional hubs, it is now more important than ever for the Fraser Valley to grow and maintain its position within this sector. The District of Mission, which was selected as XLRator’s headquarters due to its equidistance to neighboring Fraser Valley municipalities, had a strong industrial heritage catalyzed by the railway. Today, the District of Mission, along with XLRator, recognizes the importance of clean industrialization to push the region forward technologically, environmentally, and in terms of job growth. With land shortages and mounting costs of doing business within Greater Vancouver, the Fraser Valley is well-positioned to leverage the digital economy due to its affordable housing and the recent corporate interest to operate in the region. However, the District of Mission, or any municipality residing within the Fraser Valley, could not compete directly with the tech investments occurring in Vancouver. Local organizations and institutions were also finding it difficult to retain Valley talent, oftentimes losing out to the lure of a big city position. Over the course of the last ten years, XLRator has led the charge to unite the Fraser Valley tech sector, and by employing a simple “hub and spoke model,” has acted as the facilitator of collaboration between industry, government, and educational institutions. With three primary charters: supporting innovation & incubation, research & tech transfer, and skilled technical training & education, XLRator has introduced and effectively produced and/or administered a number of programs and projects to drive and support entrepreneurism and technology startups in the Valley. Programs such as the Venture Accelerator Program (VAP) and the Agri-Tech Venture Acceleration Program (AVAP) were administered by XLRator to provide the necessary education to local entrepreneurs looking to build and grow their ventures. In 2017, the Fraser Valley Tech Forum was organized in an effort to bring municipal stakeholders and the community together to discuss the ongoing needs of entrepreneurs, skilled workers, and industry to address issues including the disconnect between funding agencies and startups. In addition, XLRator created Fraser Valley Tech Jobs, a job portal for local companies to post and engage with prospective tech-sector employees through various industries including aerospace, manufacturing, information technology, and agriculture to make it easier for local companies to find, attract, and retain local talent. Over the course of the past three years, 42 startups, including Eleos Robotics and Picker Drones, have passed through programs administered by XLRator, many of which are thriving today. These entrepreneurs would have otherwise left the Valley but are now prospering in our diverse region with collaborations and funding from major organizations including British Columbia Innovation Council, Mitacs, and more. An open discussion to move the Valley forward has now been formed between municipal stakeholders. 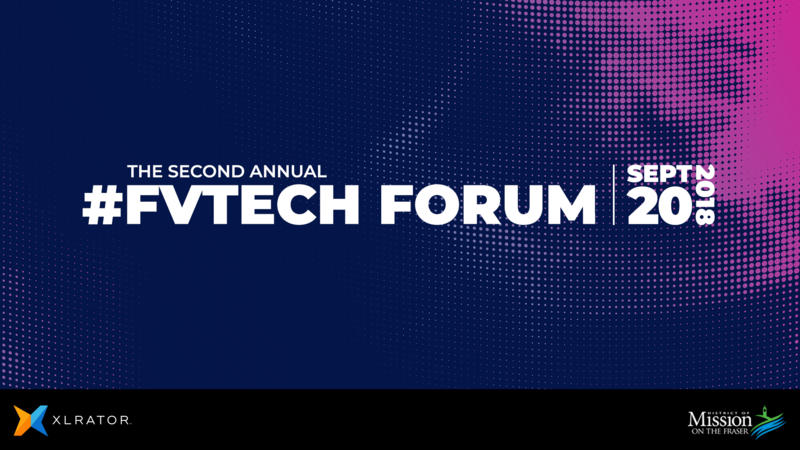 In the fall of 2017, the first annual Fraser Valley Technology Forum was held to create an open discussion between regional tech-sector stakeholders to move the Valley forward. Over 200 participants attended the event, furthering recognition and awareness of Valley needs as well as the steps required in order to achieve tech success as a region. Representatives from the City of Abbotsford, City of Chilliwack, City of Maple Ridge, the Township of Langley, and the District of Mission attended the forum along with major sponsors and influencers including Fasken, PwC, Prospera, and BDC. Following the success of the inaugural Fraser Valley Tech Forum, the City of Abbotsford has launched an Intelligent Communities Forum and the City of Maple Ridge held its first Innovation in Emerging Cities event in April 2018. 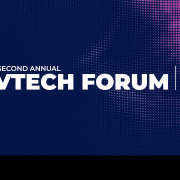 The 2nd annual Fraser Valley Technology Forum is being hosted in Mission on September 20th, 2018, which will further push the envelope for important technology discussions as related to the Fraser Valley region. In the Spring of 2018, the Fraser Valley Tech Jobs portal was redeveloped to make it easier for employers and prospective employees in the agriculture, aerospace, and manufacturing industries to connect. The Fraser Valley Tech Jobs portal will relaunch in the fourth quarter of 2018 and already has a database of job offers awaiting prospective tech and manufacturing talent. One of the biggest hurdles involved with XLRator’s aim was connecting the fast-paced technology sector culture with detail-oriented municipal processes. Working with Stacey Crawford and the District of Mission’s economic development office was integral to the success of XLRator’s initiatives. Though the two vastly different worlds of tech and government may never completely align, it’s important to begin the process sooner rather than later. Academia, industry, and government all have their own approach and vision on how to foster innovation and collaboration in the Fraser Valley. Getting regional stakeholders together in one room was incredibly important in aligning various visions to achieve a greater good. In this case, the greater good was connecting Fraser Valley municipalities to encourage and develop the tech sector while also providing our entrepreneurs with the tools they need to succeed. Mission, BC, August 20, 2018 – On Thursday, September 20th, key regional stakeholders and industry experts are participating in the second annual Fraser Valley Tech Forum co-hosted by the Sumas Regional Consortium for High Tech (SRCTec) and the District of Mission. The event aims to attract industry, government, academia, tech influencers, and community stakeholders to come together and foster growth and innovation within the local tech sector. The Fraser Valley Tech sector is growing and tech entrepreneurs are beginning to see the value in locating their business in the Fraser Valley. There is a problem: tech startups require funding in order to reach commercialization. In the past the Fraser Valley has not been able to provide this to the local entrepreneurs resulting in the local talent relocating to Vancouver where they could find adequate funding. XLRator’s mission is to bridge this gap between start-up and commercialization; not only providing the funds but also working closely with start-ups to bring innovative ideas to market. There is a gap in the market and local tech start-ups are unable to gain traction without proper funding. XLRator plans to connect high net worth individuals to innovative start-ups, creating a synergistic relationship between entrepreneur and investor that will accelerate the Fraser Valley tech sector to the next level.